California State Senate President pro Tem, Darrell Steinberg speaks in the courtyard to City College students and faculty on Prop 30 while supporters Governor Jerry Brown on the left holds up a banner and Chancellor Brice Harris (right) gives applause. Photo by Kate Paloy. California Gov. Jerry Brown visited City College Oct. 18 to address Proposition 30 and rally students to vote in the Nov. 6 election. Brown spoke on the importance of stopping statewide budget cuts on education. Darrell Steinberg, California Senate president Pro Tem; Taylor Valmores, City College Student Senate president; Brice Harris, incoming chancellor of California Community Colleges and former chancellor of the Los Rios Community Colleges District; and Jeff Freitas, secretary-treasurer of the California Federation of Teachers, joined the press conference in urging City College students to vote for Proposition 30. The event took place on Thursday in the Art Court Theatre Courtyard with an approximate turnout of 500 students, faculty, staff and community members, according to City College campus police. Those in attendance included students from other Los Rios campuses, like American River College and local media like KCRA. Steinberg kicked off the rally by getting students excited to vote. City College’s Valmores was introduced during the rally by Steinberg and spoke confidently on the importance of voting. He said he was shocked during recent Student Associated Council voter registration drives to find out how many students told him they wouldn’t go out and vote. Students attended the event for many reasons including a chance to get extra credit, to see the governor, and to find out more information on making a choice on Proposition 30. Other students weren’t in favor of the proposition. “Even though community colleges get money, sales taxes go up,” said Kathleen Reiley in response to the negative side of Proposition 30 passing. In regards to opposition of Proposition 30, which says that the revenue generated by the tax hikes included in Proposition 30 is not guaranteed to be used for education, Steinberg said that isn’t the case. Brown agreed on the topic of the opposition. According to analysts, community colleges will lose $6 billion statewide if Proposition 30 fails. 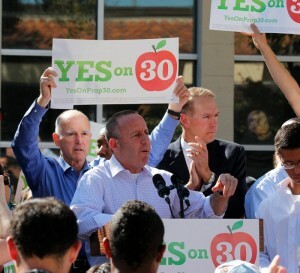 Steinberg emphasized the impact of Proposition 30 on City College. For more on the event and Proposition 30, see the upcoming print edition of the Express, which will be on newsstands around the City College campus on Oct. 23 and online Oct. 25. More information on Proposition 30 is available here. Additional reporting by Wendy Aguilar. This entry was posted in News, Sac City Express (SCC) and tagged Art Court Theatre, Brice Harris, City College, Darrell Steinberg, Jerry Brown, KCRA, los rios, newstands, Nov. 6, Obama, Proposition 30, Student Associated Council, Taylor Valmores, voters, Wendy Aguilar. Bookmark the permalink.